This map is basically mazing contest 2 with larger build areas. There is no difference in game modes, except some rng numbers. Most of the terrain was redesigned, just to not have a boring looking map with bigger size. For detailed information about game modes/mechanics read the description of my Mazing Contest 2 project page. I just want to point out the differences here so it isn't a duplicate post. Traps: New game mode instead of penalty. Healtower: Reach the longest time and do not let your runner die or he will be teleported to the exit. Under 50% HP your runner will be slowed by 45% because of heavy blood loss! or speedbuff towers. The healing ability has a cooldown of 5 seconds and a delay of 1 second until it heals. Traps: Small traps spawn in your maze that teleport the runnder back to the start upon activation. Traps can only be used one time, so build your maze carefully to make maximum use out of them. Important to notice is that you have to force the runner to directly step on it or it wont trigger the trap. Sometimes pathing can choose to dodge the trap so make it non-dodgeable to be sure! Tower bombs: 0-3 tower bombs instead of 0-2 and much higher chance to get some. As part of mazing contest ultra v1.1 I introduced a new game option for both map sizes. Checkpoints: You can place a checkpoint (item) anywhere in your maze and the runner will go there first. To do this you simply drop the item on the ground where you prefer. If you place it somewhere inaccessible the runner will try to reach it as far as possible before going towards the end. This mechanics alters the maze building significantly and you build structures similar to Gem TD for example. If you set this option to "random", the flag will be randomly placed each level (in sync for all players). Should you manage to get your runner stuck the game will send it to the exit after 90 sec. Also players can use the -unstuck command to send their runner towards the goal. I added a point system to version XL 1.8 which makes the map less frustrating. Sometimes it can happen that you fail a round or forget to place your checkpoint which is impossible to catch up then. Mazing points are a different way to win the game, you get +3 for being first and +1 for being second on time each round. At the end of the game 2 winners will be shown (highest time and highest score). first "real" bugfix in any game mechanics. Maybe some explanation first: There are basically 2 major bugs in mazing contest since it release (e.g v1.2 has this bugs too). Here are 2 scenarios bug 1: https://i.imgur.com/8ANQO2y.jpg bug 2: https://i.imgur.com/rakBIjx.jpg. I was finally able to fix the bug 1, so you won't have to build a tower on that X to make the clap trigger. Regarding bug 2 i did not come up with any solution yet. Still these are no new bugs and classic mazing contest has them too! 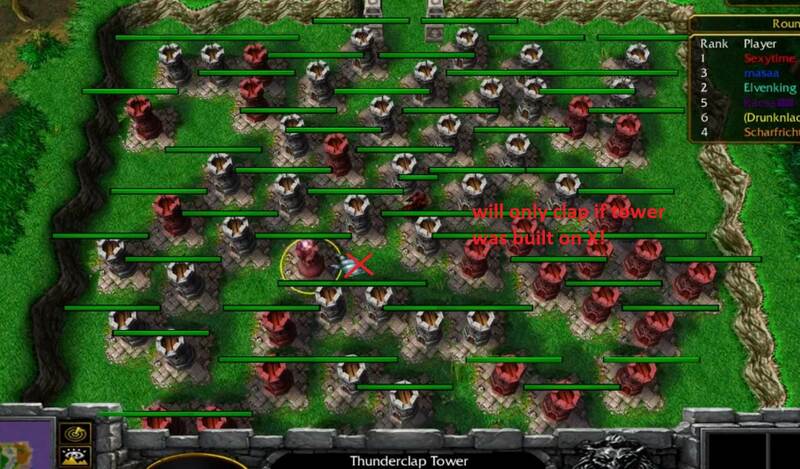 fixed bug 2 with an algorithm to always stun in exactly 45 degree (top right corner) of a thunderclap tower. fixed bug that tower bomb indicators didn't despawn after the last round and persisted forever if you restart the game. fixed all bugs concerning thunderclaps not working. Each angle should now have the exact same behaviour. again bugfix on thunderclaps. Increased range of the ability to 300 but trigger will only react at 250 range. This prevents thunderclaps that are castet but don't hit the runner. Added new game option "Checkpoints"
Added a few unstuck systems because of the bug that wc3 pathing sometimes bugs out if the flag is blocked. Added a score system to the map (mazing points). This makes the gameplay less frustrating if you completely fail one round. The first player to finish a round gets +3 point, the second one +1 point. At the end of the game 2 winners are shown (highest time and highest points). Added blinkmode (new) as ability to the builder. If you enable it your builder will teleport around instead of moving. This makes it easier to set some last second towers. 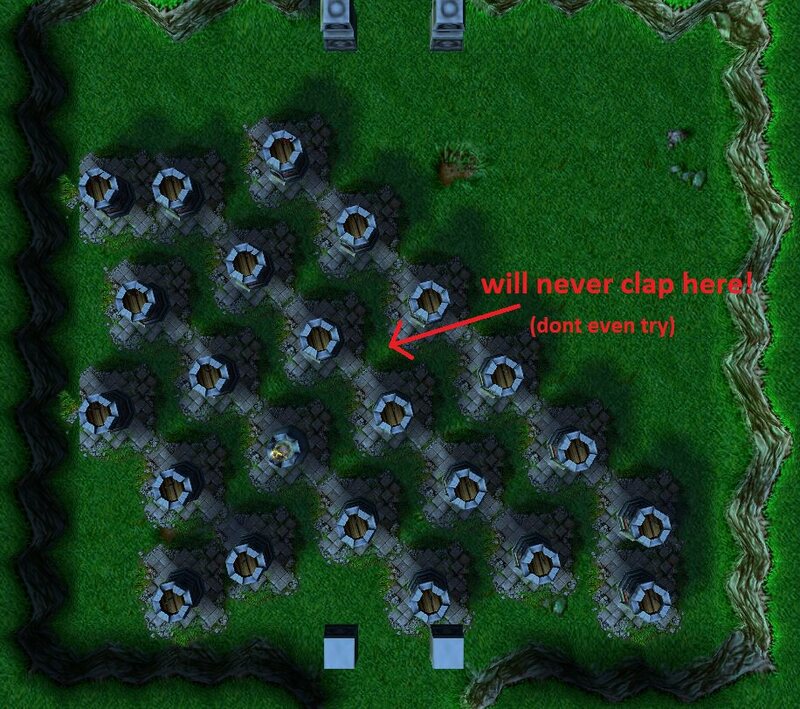 There are some exceptions to the blinkmode, the builder will not blink if you use tower bombs or drop/pick the flag in checkpoint mode. If i enable blink for there too it bugs out and will never carry on the order it had. Added some system for random flag mode to significantly decrease the probability of having a flag on entrance or exit of the maze. It is still possible but like 1 out of 1000 instead of 1 out of 100 rounds. Added new game mode "traps" instead of penalty. Description above, basically small traps spawn in the maze that teleport your runner back to start. Added custom mode selection for traps and option to choose 1-3 instead of just 1 trap. Fixed a bug that traps (and even checkpoints) could spawn and block the entrance/exit of the maze with their dummy tower. Music at the end of game stops now after selecting a new mode. UPDATE: Uploaded map again with small hotfix to trap + random checkpoint mode togheter. Also fixed flag and trap placement in normal size ( it used XL values for positioning ). Thanks to everyone who played my maps, you motivated me to implement more features and making this XL version. Thanks to Peppolino my reliable friend who always plays mazing contest with me and tested like every version. Thanks to Sexytime. and his clan IBCE for playing my maps very often and helping me with bugs and suggestions. Thanks to CRAZYRUSSIAN, I used your zoom in and zoom out buttons icon in my map (Btncrzoomin, Btncrzoomout). Thanks to Blood Raven for the muffin model I used in the environment. Creator of mazing contest PENDER for the best map ever made!